NJW Construction > news > Open Floor Plan Versus Traditional; Which Speaks to You? Open Floor Plan Versus Traditional; Which Speaks to You? At NJW, your Columbus Ohio contractors, we want to get to know you…in the sense that we can understand your design style. What do you prefer, a more traditional floorplan or an open one? These are the questions we like to ask before doing a home remodel, addition, or residential renovation. An open home plan has one or more large, open rooms that function as multiple rooms within a single living space. The most common is a “great room” that combines the kitchen, dining room, and living room into one shared space. These floor plans usually work extremely well in homes with less square footage – sometimes out of necessity – while larger homes have more leeway to work with when integrating great rooms into a floor plan. In our experience as your respected home improvement company, spacious homes with fewer walls are more popular than ever. More social time: The person cooking or cleaning in the kitchen can converse with people in other rooms. Keep an eye on the kids: Great rooms allow parents to cook and do other household duties while their kids play in the same room. Increase views and natural light: The removal of interior walls allows sunlight from windows in the exterior walls to permeate throughout the house. NJW, when we deal with a room addition or remodeling project, we are conscientious of remaining true to a home’s personality, some homes lend themselves to a closed floor plan, and there are advantages to those plans as well. 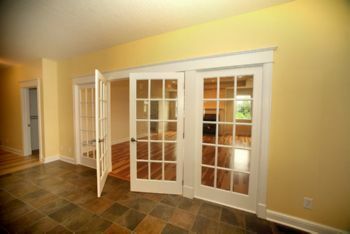 Closed floor plans offer a larger number of smaller sized rooms that can provide privacy and organization. More privacy: Many households have people contending with different ages and schedules, from babies to teenagers and grandparents or nannies that all live in the same home. Enclosed spaces may work better in a house where everyone needs their space. More walls for artwork: If you enjoy artwork and need a lot space to display your favorite work you will need wall space. Easier to clean/contain messes: You may prefer an enclosed playroom for kids or rooms with doors that can keep messes out of the main rooms. We want to be sure you are choosing the right floor plan for you and your family. We have noticed that a majority of modern homes combine a variety of layout options. It makes sense for most households to maintain a more spacious design on the main level and smaller, separate rooms in the second floor, basement, or attic. As your preferred Columbus Ohio contractors, we don’t necessarily feel that your household needs to pick one or the other. Regardless of your home’s current floor plan, if the layout’s not working for you anymore – and maybe it never really did – it’s time to think about how you can make better use of the existing space, and we can help you with that! We currently build in,Upper Arlington, Powell, Pickerington,New Albany,Lancaster, Bexley,Gahanna,Westerville,Worthington,Whitehall,Dublin, Hilliard,Columbus and all of Central Ohio. Contact us today!